YSU first baseman Marcus Heath attempts to catch the ball to tag out the University of Akron’s Joey Haverlak during Wednesday night’s matchup at Eastwood Field in Niles. Photo by Dustin Livesay/The Jambar. 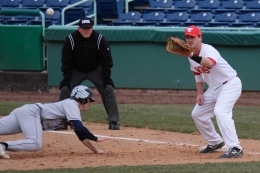 It was an opportunity for the Youngstown State University baseball team to get its home season off to a perfect start. But just like the Penguins’ base runners in the final two innings, that opportunity was stranded. The Penguins (7-20) left the tying run on third base in the eighth and ninth innings, as they fell to the University of Akron, 5-4, Wednesday afternoon at Eastwood Field in their home opener. “It was definitely a game that we had opportunities and had we executed a little better, the score could have easily flipped in our favor,” said YSU’s head coach Steve Gillispie. Trailing 5-4, Drew Dosch led off the eighth inning with a walk. He reached third base with one out after a couple of wild pitches by Akron Zips pitcher Samuel Trecaso. But then Trecaso settled in. He caught Phil Lipari looking at the third strike for the second out. The senior pitcher then got David Saluga to strike out swinging, ending the YSU threat. As for the ninth inning, Josh White singled with one out. He reached third with two outs on a single by Mike Accardi. However, a groundout by Neil Schroth stranded White and ended the game. Akron (5-21) stuck first, as Zips left fielder Jared Turocy launched a two-run homerun to right field in the top of the second inning. Akron got to YSU starting pitcher Pat Shedlock again in the third inning when a double by Matt LaRocca scored another run. Shedlock exited, giving way to Russ Harless, who allowed a sacrifice fly to Turocy for a 4-0 Zips lead. Shedlock’s final line was two innings pitched, allowing four earned runs on four hits. The YSU bullpen performance was a different story. Harless, Erik Okleson, Patrick O’Brien and Nic Manuppelli allowed only one run in seven innings of work. YSU cracked the scoring column in the fifth inning. An RBI groundout by Jason Shirley brought home the Penguins’ first run. They added another run when Shirley scored following a throwing error by Akron third baseman Billy Salem. A Salem RBI single stretched the Akron lead to 5-2 in the sixth inning, before the Penguins responded in the seventh. YSU opened the inning with consecutive singles by pinch hitters Nick DiNello and Josh White. Shirley then singled for his second RBI of the game. Another single by Accardi brought home White and cut the deficit to 5-4. Still, Gillispie couldn’t help but notice the missed opportunities throughout. YSU will open a three game series against the University of Wisconsin-Milwaukee at home on Thursday at 3 p.m.